A recent report published by Infinium Global Research on liquid biopsy market provides in depth analysis of segments and sub-segments in global as well as regional liquid biopsy market. The study also highlights the impact of drivers, restraints and macro indicators on the global and regional liquid biopsy market over the short term as well as long term. The report is a comprehensive presentation of trends, forecast and dollar values of global liquid biopsy market. According to report the global liquid biopsy market is projected to grow at a CAGR of 21.1% over the forecast period of 2018-2024. The analysis of non-solid biological tissue, mainly blood is known as liquid biopsy or as fluid biopsy. This type of technique is mainly used as a diagnostic and monitoring tool for diseases such as cancer. FDA has validated and approved liquid biopsy for circulating tumor cells as a useful prognostic method for various types of cancer. Liquid biopsy tests are done to understand the molecular aspects of cancer across the healthcare and research settings, such as physicians, pathological, hospitals, and research laboratories. It is a harmless blood test that will not damage the healthy tissues .The researchers, physicians, and surgeons get appropriate data about patient’s cancer condition, with the help of this test appropriate therapy is provided to improve the survival rate of the cancer patients. The increasing incidences of the cancer worldwide is likely to drive the growth of the market. Additionally, easy and non-invasive entrance to the tumor genome, early cancer diagnosis & detection and technology advancement and novel clinical trials for research and development is likely to propel the growth of the market. On the other hand, the lack of skilled professional to take the blood sample is likely to hamper the growth of the market. In addition, the reimbursement of medical costs and changing governmental policies are likely to restraint the growth of the market. Among the geographies, North America is expected to be largest market for liquid biopsy followed by Europe due to recent regulatory approvals by CE for commercial use of liquid biopsy tests in this region. In addition, adoption of technologically advanced products and increasing research and development funding/investments is likely to drive the growth in this region. While, Asia-Pacific is expected to grow fast during the forecast period, owing to rising prevalence of different cancer types, and growth in per capital health expenditure in countries like China and India is likely to augment the growth in this region. The report on global liquid biopsy market covers segments such as, product. On the basis of product the global liquid biopsy market is categorized into (CTCs and ctDNA and exosome. On the basis of end-user the global liquid biopsy market is categorized into clinical diagnostic laboratories, hospitals, and physician’s office laboratories. The report provides deep insights on demand forecasts, market trends and micro and macro indicators. In addition, this report provides insights on the factors that are driving and restraining the global liquid biopsy market. Moreover, IGR-Growth Matrix analysis given in the report brings an insight on the investment areas that existing or new market players can consider. The report provides insights into the market using analytical tools such as Porter's five forces analysis and DRO analysis of liquid biopsy market. Moreover, the study highlights current market trends and provides forecast from 2018-2024. We also have highlighted future trends in the liquid biopsy market that will impact the demand during the forecast period. Moreover, the competitive analysis given in each regional market brings an insight on the market share of the leading players. 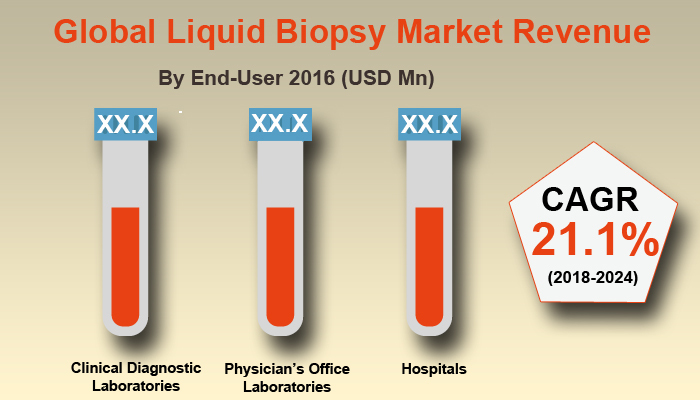 This report will help manufacturers, suppliers and distributors of the liquid biopsy market to understand the present and future trends in this market and formulate their strategies accordingly.